In honor of simplicity and upcoming Super Bowl parties, I've decided to forgo the weekly tip and share a three-ingredient recipe with you instead. These small, bite-sized appetizers are virtually impossible to mess up. Even if you somehow manage to do so (a feat that would leave me baffled), you will still be left with barbecue sauce, bacon, and water chestnuts. You can never go wrong with barbecue sauce and bacon. Remember that. They say that bacon is the way to a person's heart. I, however, am part of the rare breed who doesn't love bacon (popcorn, oddly enough, is the way to my heart). I avoid bacon during Sunday brunch and ignore the bacon enhanced pasta dishes on the Italian restaurant menu's offerings. So when my mother reminisced over her favorite Super Bowl appetizers, I was hesitant to give this one a try. Bacon and water chestnuts? Would that really taste good? As it so happens with me, when I grow skeptical over a particular dish or dessert, I suddenly have to give it a try. Usually, I'm happy with the result. With these toothpick appetizers, I was blown away. The crispy water chestnuts provide a great texture contrast against the chewy bacon slices. With the barbecue sauce baked into every crevice, you might find yourself eating more than your fair share. 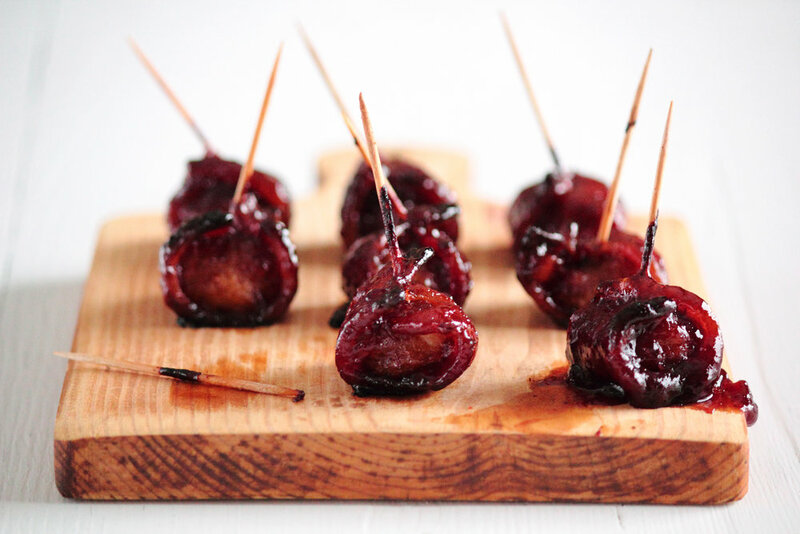 BBQ Bacon Wrapped Water Chestnuts are unique appetizers for Super Bowl get-togethers, dinner parties, and Tuesday evenings (just because). Water chestnuts are wrapped in bacon slices and secured with toothpicks before roasting the in oven. 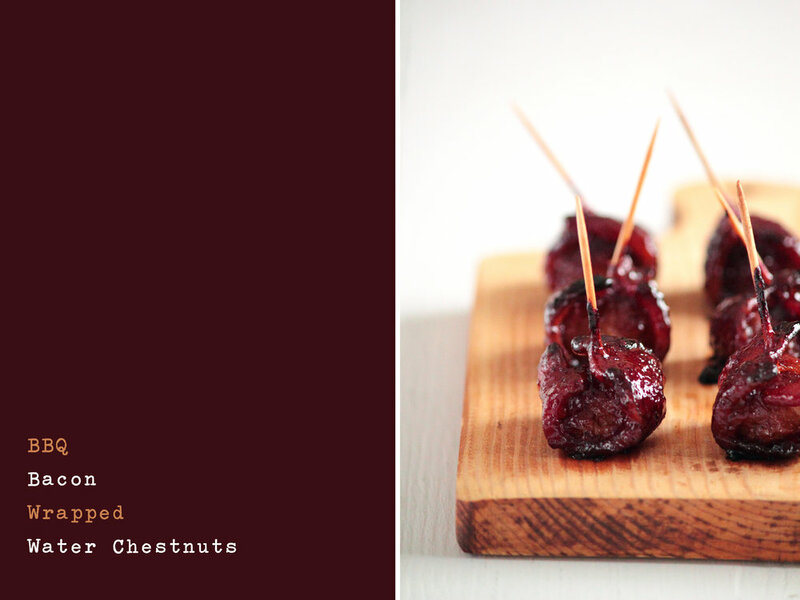 The bacon wrapped water chestnuts are then coated heavily with barbecue sauce before heading back into the oven to bake in the barbecue flavor. These are best served hot (and will disappear quickly). Preheat oven to 350 degrees F (180 degrees C). Line a rimmed baking sheet with a non-stick baking mat or parchment paper. Alternatively, a broiler pan would also work well. Wrap each water chestnut with bacon and secure with a toothpick. Depending on thickness of bacon, you will be able to wrap 2-3 water chestnuts per slice of bacon. Place on prepared baking sheet and bake for 40 minutes. Remove from oven and very carefully drain off bacon grease. Dip each water chestnut in barbecue sauce and place back on baking sheet. Bake for an additional 15-20 minutes to bake in barbecue sauce. Let stand 5 minutes before serving. Best served hot!